Nassau County Legislator Laura M. Schaefer and Nassau County Legislator Rose Marie Walker were pleased to attend the Theodore Roosevelt Council Boy Scouts of America Diversity and Leadership Awards Luncheon. The mission of the Boy Scouts of America is to build character, citizenship, and physical fitness. This time-tested program teaches leadership skills and solid moral values that last a lifetime. 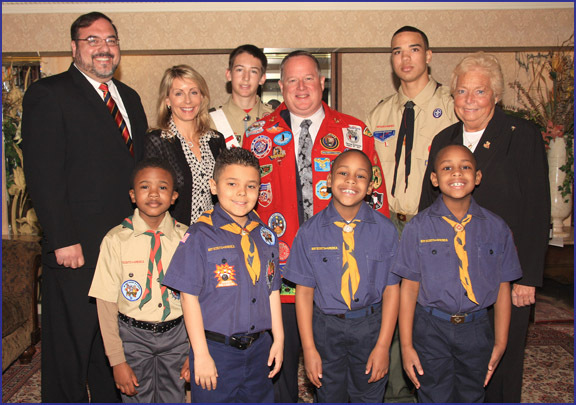 Pictured: L to R: Sal Ciampo, President, Boy Scouts of America, Theodore Roosevelt Council; Legislator Laura Schaefer; Eagle Scout Ryan Clifford, Troop 656; Nassau County Commissioner of Parks Brian Nugent (Honoree); Eagle Scout Aasin Pritchard, Troop 300; Legislator Rose Marie Walker; and members of Theodore Roosevelt Council BSA Cub Scouts.